âEpic Trailerâ is a powerful, strong and inspiring background cinematic music with atmospheric orchestral sound and heroic motivational hollywoodâs blockbuster mood, suitable for inspirational epical videos, soundrack, movie, slideshow and reports about history and adventure, battle, nature, documentary, trailer for film, digital marketing, sport events, video games, presentation, discovery video, TV series and more. This music kit is based on my original AudioJungle item: Epic Trailer WAV files included in MUSIC KIT Sounds great in: Viral marketing, TV, advertisement, commercial, presentation, slideshow, movie, party, travel video, video games, soundtrack, corporate, motion design, animation, youtube background, motivational video, adventure, extreme videos, sports news, competition, fight or fighting, aggressive & driving, race or racing video, rally, snowboard, bicycles, motorallyâ¦ What is a MUSIC KIT? Music Kits are a more flexible, production ready music offering that provides fully produced music tracks in an easy to work with, modular way. Where typical music items are fixed length tracks, Music Kits are provided as separate drag-and-drop song sections built to provide natural musical transitions and endings that can be arranged seamlessly on a project timeline, with no additional mixing, editing, or crossfading required. 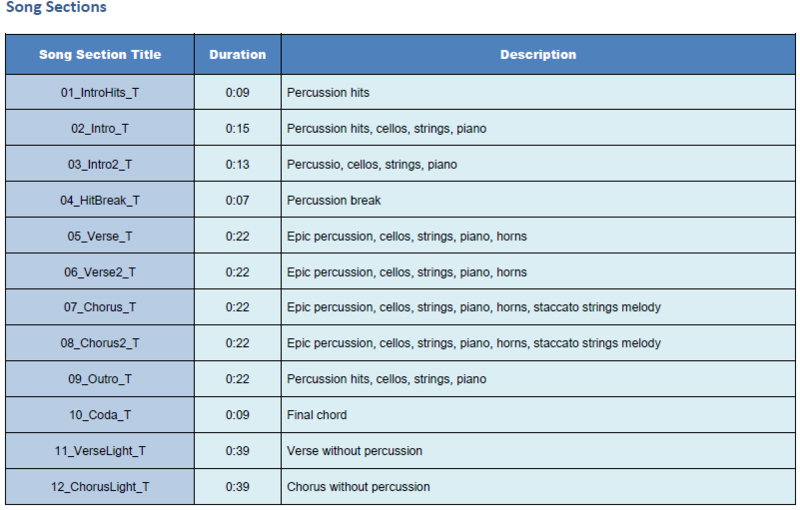 All of the sections from the original music track are included in this music kit. You also got three demos that show how quickly and easily you can move pieces of the song around and achieve almost any desired results with length, atmosphere and transitions. You will receive all the WAV files of all three demos (unwatermarked) plus documentation containing instructions and a description of the segment sequence for those demos are included within the zip file you will download. Have any questions? I`m happy to answer you! Contact me now! Check my other tracks and collections! To all VideoHive Authors You are more than welcome to use any of my preview tracks in your video items! (please, do not forget to link to the music in your description, and drop me back e-mail, so I could update my item description too with the link to your item).